In a strange new world where hot air doesn't rise and heat doesn't conduct, the International Space Station's thermal control systems maintain a delicate balance between the deep-freeze of space and the Sun's blazing heat. This is the second in a five-part series of articles about the construction of the ISS. The first examined the Station's architecture and structural design. Future installments will explore the power, plumbing, and ergonomics of the Station. March 21, 2001 -- The universe is a place of wide extremes: light, dark... wet, dry... air, vacuum... hungry, fed. Human life tends to flourish in the balance. We feel most comfortable in places that are not too hot or too cold, not too light or too dark -- in other words, places that are "just right." Most of our planet fits that description. As long as you stay away from the South Pole and don't fall into a volcano, Earth is a pretty comfortable world. But now that humans are venturing into space -- not as visitors, but as homesteaders -- finding the right balance is more of a challenge. Consider, for example, the International Space Station (ISS). Without thermal controls, the temperature of the orbiting Space Station's Sun-facing side would soar to 250 degrees F (121 C), while thermometers on the dark side would plunge to minus 250 degrees F (-157 C). There might be a comfortable spot somewhere in the middle of the Station, but searching for it wouldn't be much fun! Fortunately for the crew and all the Station's hardware, the ISS is designed and built with thermal balance in mind -- and it is equipped with a thermal control system that keeps the astronauts in their orbiting home cool and comfortable. The first design consideration for thermal control is insulation -- to keep heat in for warmth and to keep it out for cooling. Here on Earth, environmental heat is transferred in the air primarily by conduction (collisions between individual air molecules) and convection (the circulation or bulk motion of air). "This is why you can insulate your house basically using the air trapped inside your insulation," said Andrew Hong, an engineer and thermal control specialist at NASA's Johnson Space Center. "Air is a poor conductor of heat, and the fibers of home insulation that hold the air still minimize convection." Above, left: Common home insulation on Earth. 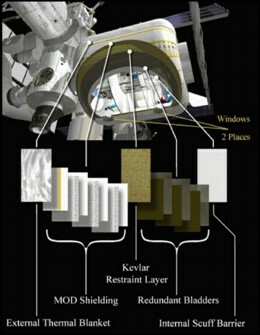 Above, right: Multi Layer Insulation -- or MLI -- for the International Space Station. The reflective silver mesh is aluminized Mylar. The copper-colored material is kapton, a heavier layer that protects the sheets of fragile Mylar, which are usually only 0.3 mil or 3/10000 of an inch thick. Photo courtesy Andrew Hong, JSC. "The Mylar is aluminized so that solar thermal radiation can't get through it," explains Hong. Here on Earth, we use blankets containing aluminized Mylar to wrap people who have been exposed to cold or trauma. Such blankets are especially popular among hunters and campers! "Layers of dacron fabric keep the Mylar sheets separated, which prevents heat from being conducted between layers," he continued. "This ensures radiation will be the most dominant heat transfer method through the blanket." Except for its windows, most of the ISS is covered with the radiation-stopping MLI. "Windows are a tremendous heat leak," said Hong, "but astronauts need them for ergonomics and also for their research. It's something we have to design around." MLI insulation does a double-duty job: keeping solar radiation out, and keeping the bitter cold of space from penetrating the Station's metal skin. It does its work so well that the ISS presents another thermal challenge for engineers -- dealing with internal temperatures that are always on the rise inside this super-insulated orbiting laboratory fully stocked with many kinds of heat-producing instruments. Imagine that "your house was really, really well insulated and you closed it up and shut off the air-conditioning," said Gene Ungar, a thermal fluid analysis specialist at NASA's Johnson Space Center. "Almost every watt of power that came through the electric wires would end up as heat." This is just what happens on the Space Station. Energy from the solar arrays flows into the ISS to run avionics, electronics ... all of the Station's many systems. They all produce heat, and something has to be done to get rid of the excess. The basic answer is to install heat exchangers. Designers created the Active Thermal Control System, or ATCS for short, to take the heat out of the spacecraft. Waste heat is removed in two ways, through cold plates and heat exchangers, both of which are cooled by a circulating water loop. Air and water heat exchangers cool and dehumidify the spacecraft's internal atmosphere. High heat generators are attached to custom-built cold plates. Cold water -- circulated by a 17,000-rpm impeller the size of a quarter -- courses through these heat-exchanging devices to cool the equipment. "The excess heat is removed by this very efficient liquid heat-exchange system," said Ungar. "Then we send the energy to radiators to reject that heat into space." But water circulated in pipes outside the space station would quickly freeze. To make this fluid-based system work, waste heat is exchanged a second time to another loop containing ammonia in place of water. Ammonia freezes at -107 degrees F (-77 C) at standard atmospheric pressure. The heated ammonia circulates through huge radiators located on the exterior of the Space Station, releasing the heat as infrared radiation and cooling as it flows. The Station's outstretched radiators are made of honeycomb aluminum panels. There are 14 panels, each measuring 6 by 10 feet (1.8 by 3 meters), for a total of 1680 square feet (156 square meters) of ammonia-tubing-filled heat exchange area. Compare that majestic radiator with the 3-square-foot grid of coils found in typical home air conditioners and you can begin to appreciate the scope and challenge of doing "routine" things in space. Finally, thermal control engineers must address air flow within the Space Station. The movement of air is a major factor in achieving the balance between hot and cold. The ATCS works in tandem with the Environmental Control and Life Support System (ECLSS) that controls air quality and flow in the ISS. In orbital free-fall conditions -- equivalent to zero-G -- hot and cold air don't rise and fall as they do on Earth. Proper air circulation helps prevent unwanted cold spots that could produce condensation, electrical shocks, serious corrosion and even biological problems such as microbial growth. Corrosive fungi were a nagging problem on Russia's Mir space station, and ISS mission planners want to avoid a repeat infestation. Above: Floating through space in short sleeves and bare feet? It must be comfortable up there! It is indeed a strange new world on the ISS. Hot air that doesn't rise ... heat that doesn't conduct ... radiators too cold for liquid water ... it's enough to give a thermal engineer gray hairs! But thanks to the Station's efficient integrated thermal control systems, the crew needn't worry -- staying cool on the ISS is no problem! Editor's note: One reader asks, "If the temperature of the shadowed side of the Space Station can plunge to -250 F and if the freezing point of ammonia is only -107 F, why doesn't the ammonia in the station's radiators freeze?" The reason is that the heat-bearing ammonia can't lose heat fast enough to reach its freezing point before the liquid circulates back inside the warmer confines of the Space Station. If (as a thought experiment) we turned off the pumps and oriented the Station so that the radiator was in the shadow of, say, a solar panel, the ammonia would likely freeze after some period of time. Seeing the International Space Station from your own backyard -- Science@NASA article: With the aid of free NASA software you can spot the International Space Station from your own back yard. Looking Forward to the ISS -- Science@NASA article: Scientists at a recent media forum say they are eager to begin using the International Space Station as an innovative orbiting research laboratory. Wheels in the Sky -- Science@NASA article: The pioneering space station concepts of the mid-1950's don't look much like the erector-set habitat in orbit today. A New Star in the Sky -- Science@NASA article: Something in the heavens is growing brighter and it will soon become one of the more eye-catching stars in the night sky. No, it's not a supernova. It's the International Space Station! Breathing Easy on the Space Station -- Science@NASA article: Life support systems on the ISS provide oxygen, absorb carbon dioxide, and manage vaporous emissions from the astronauts themselves. It's all part of breathing easy in our new home in space. Water on the Space Station -- Science@NASA article: Rationing and recycling will be an essential part of life on the International Space Station. In this article, Science@NASA explores where the crew will get their water and how they will (re)use it. Microscopic Stowaways on the ISS -- Science@NASA article: Wherever humans go microbes will surely follow, and the Space Station is no exception.